I've been surprised to find that a lot of candied nut recipes call for egg whites. They definitely don't have to be made that way, though. I've adapted this recipe for candied pecans from epicurious. It uses corn syrup and my son is allergic to corn. At first, I thought I would make a simple syrup and try to make it with those, but in the end, I thought, "What about using Steen's?" 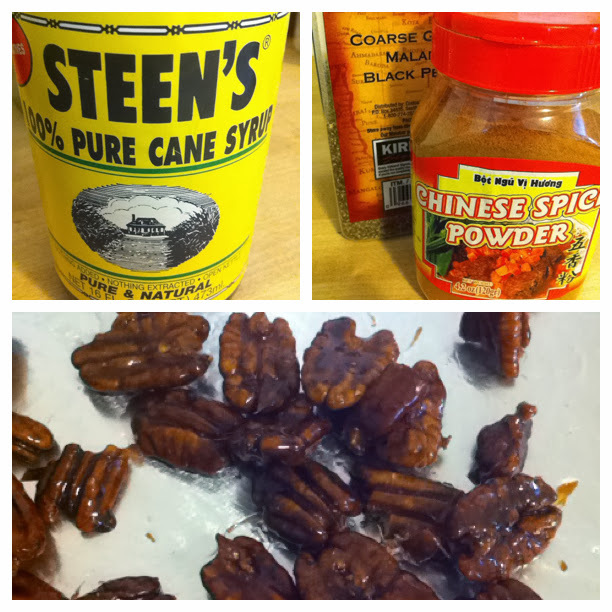 Steen's is a sugar cane syrup made in Louisiana and all the best Southern pecan pies I've ever had are made of it. I've yet to attempt a vegan pecan pie yet (hello, four eggs?!) but my sister-in-law introduced me to these nuts and said, "You know, it's like the best part of the pecan pie." I agree. That hard, candied layer of pecans on top is definitely the best part and really the only part I need. Who needs to veganize a whole pie when you can just eat the top? Usually this calls for cayenne and pepper, but I've made it now using a variety of spices and it turns out great each time. Sometimes, I even use more spice than called for when I like a particular flavor. The Steen's syrup is a dark syrup with some of the molasses still in it, so it goes great with fall and holiday spices like ground ginger, cinammon and cloves. I even made a batch with Chinese Five Spice powder and they were terrific. The original recipe called for less nuts, but after making this a bunch of times, I've found you can make a bigger batch and they still are coated enough. I've also raised the temperature a little since sometimes the batches would come out chewy at the original time and temp and you want them to be crunchy. Still, even the chewy batches disappear quickly! Preheat oven to 350 degrees F. Line a rimmed cookie sheet with foil and then spray the foil with oil. Mix all ingredients except nuts thoroughly and then add nuts and stir until they are well coated. Pour onto your cookie sheet and flatten into a single layer. Cook for 7 minutes and then use a fork to stir the pecans and continue cooking for another 7-8 minutes. The coating should be bubbling in the middle at the end of your cooking time. If it isn't, let it go a minute or two more but keep checking on them to make sure the nuts don't burn. *Spice combos I've tried: Coarse ground black pepper and cayenne, Chinese five spice powder and cayenne or coarse ground black pepper, ginger and cinnamon, white pepper and ginger, cinnamon and nutmeg, curry powder and cayenne.